This past Monday, December 3, the Wake County Board of Commissioners (WCBOC) met and approved the awarding of over $550,000 in construction contracts, as well as giving their approval on all project funding in what will certainly help the children in the area to “stay cool” all summer long, as construction will begin next month with a tentative opening date of Spring 2019 on an all- new Knightdale Splash Park to be located at Knightdale Station Park. The plan for the Knightdale Splash Park (rendering pictured above) has been in the works since the initial plans were drawn up for the Knightdale Station community in 2016, as evidenced by the “Project Location Map” which was shown at Monday’s meeting, detailing all of the projects that have been completed and those that were planned to be implemented at some point when the town’s “first master planned community” was still just in its planning stages. A slight hitch in the process occurred when the Knightdale Splash Pad project was put out for bidding, and once received on October 10, 2018, it was discovered that all the bids received came in significantly higher than the projected $575,000 budget. 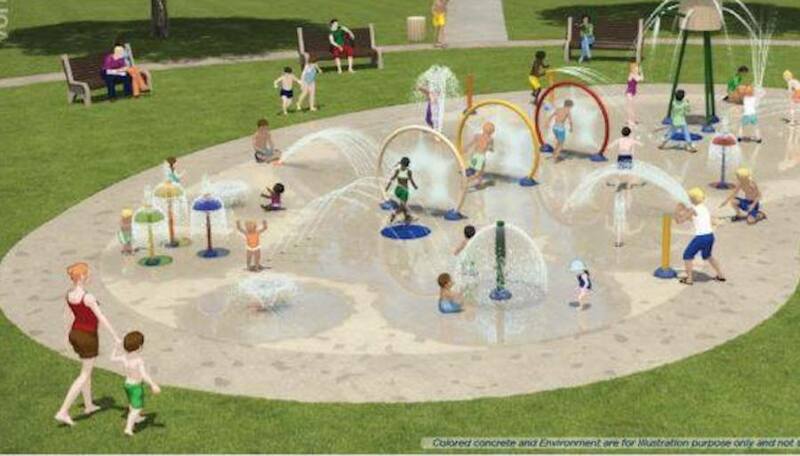 Not to be deferred and keeping the kids across the community in mind, the design of the Knightdale Splash Park was slightly altered and there was a re-bid that included a cost request for the design and separate pricing for anything that may be considered an “add-on” to the project. For further information on the new Knightdale Splash Park…at the Station, including the minutes from this past Monday’s (12/3) meeting of the WCBOC, visit www.wakegov.com.